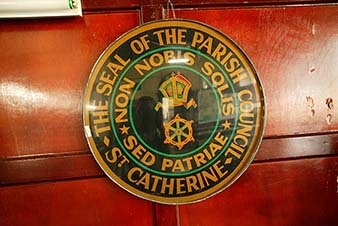 Photograph of the seal of the St. Catherine Parish Council. Radcliffe Morgan (National Library of Jamaica), “St. Catherine Parish Council seal,” National Library of Jamaica Digital Collection , accessed April 20, 2019, https://nljdigital.nlj.gov.jm/items/show/5172.